Along with the slew of information released by the DfE last week came a very long, detailed survey of family experience of the Education, Health and Care Plan process in 2015. It was carried out, apparently, to help construct the SEND accountability framework. However, although it is an large piece of research, it has a major drawback: The data is ONLY based on children and young people who began and completed their EHCP journey between 1st January and 31 December 2015. This means if you began an application for an EHCP or a transfer from an SEN statement at the end of 2014 but you didn't conclude a plan until January 1st 2016, your child was not included. If you applied in 2015 and went to Tribunal that went over into 2016, your child's data was not included. If your child got an EHCP in 2015 and they went to an independent special school, their data was not included. These are all cases where the parental experience was very possibly to have been none too pleasant. So, with this warning, let us look at what it revealed. The DfE commissioned the University of Derby to design, pilot and roll out a national survey tool, CEDAR, that would explore the experiences of 'service users' (families) and their views on the impact of Education Health and Care (EHC) plans. The DfE also commissioned a survey of parents and young people with an EHC plan, to create a national picture of their experiences. There were 13,643 responses with the survey exploring both positive and negative aspects of parent and young people’s experiences. We've made an infographic at the end to help you visualise the points we're covering in this post. To what extent does this vary by local authority and by groups with different characteristics? As mentioned, the survey focused on children and young people with an EHC plan that had been created in the calendar year 2015. They were identified from two official databases: The National Pupil Database and the Individualised Learner Record. 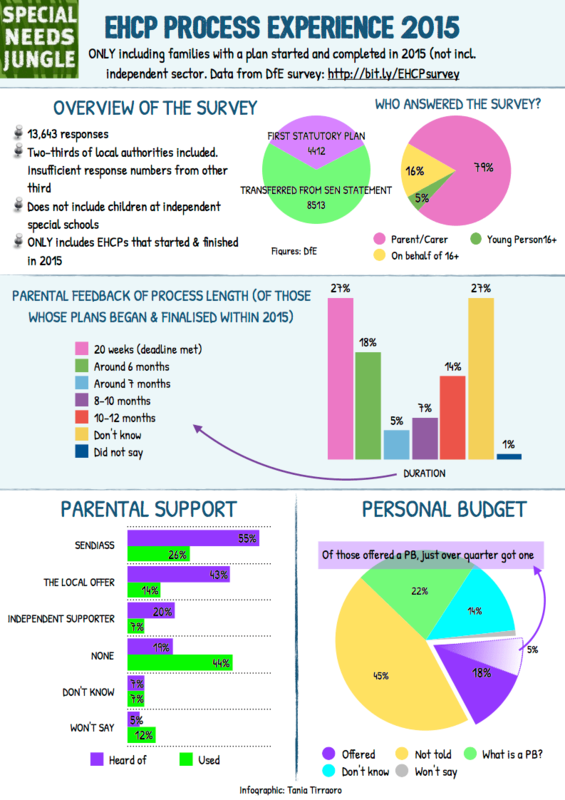 65,172 children and young people were supported by an EHC plan in 2015. The data does not include children or young people attending who attend a placement under section 41(independent settings). The parent and young people were invited to complete an online or paper questionnaire or telephone conversation. Where the young person was 16 or over they were invited to provide their responses. Only those children and young people supported with an EHC plan 2015 were surveyed and does not include anyone who may have requested an EHC needs assessment or plan and been refused. To reiterate: the research did not include, any plan that was not started, or completed, for whatever reason, within 2015. This is clearly a huge omission when deriving a true picture of parental experience. 23% said that they did not know. Examining the questionnaire sent to the parent and young person it does not ask them specifically about the EHC assessment process. So, how can a large survey ask about experience, but not ask about the EHC assessment itself, which is a required step to obtaining a EHC plan? Did these children have proper assessments for education, health and social care, where needed? Did those transferring have new assessments or just get their statement in a new template with EHCP at the top? We don't know. 15% had to make more than one request for an EHC plan. Were any after a previous loss at an appeal tribunal? 50% rated it as very easy to start the process compared to 23% who found it very difficult. Why was this? 38% of the respondents who found the process difficult were new requests. “The difference in figures may reflect parents/young people and local authorities using a different starting point when timing the 20-week period…” (p. 17, footnote 14). There should not be a different starting point. The law makes it clear and the SEND Code of Practice 2015 provides a very clear visual which displays the timeline. If parents and young people are provided with the correct and accurate information there can be no confusion. Correspondence to parents and young people should be explicit about timescales. Are parents routinely misunderstanding when the clock starts or are LAs starting the clock at a different point and reporting different data? The research sheds no factual light on this. any social care provision reasonably required by the learning difficulties and disabilities which result in the child or young person having special educational needs, to the extent that the provision is not already specified in the plan under paragraph (e). (3) An EHC plan may also specify other health care and social care provision reasonably required by the child or young person. Did the process use the co-production model? Co-production or, working with parents and young people, to put the plan together was one of the main tenets of the reforms. Did it happen for this cohort? 75% of parents and young people said the process was family-centred some of the time and 58% felt they had been listened to and 51% were included in meetings. Only 44% of children or young person were asked if they wanted to take part in the meetings. Self-advocacy was not mentioned and only 19% were provided with choices of how to take part. Where is the person-centred planning? This is not a new concept. A special school I worked with in South East London developed communication aids to ensure ALL children and young people contributed in meetings. This meant their voice was heard and was included in the EHC plan and was the starting point of the journey, not a bolt on. We've run posts in the past about IASS and Independent Supporters who are there to help parents through the process. We've also talked about the Local Offer of information. Only 43% were aware of the Local Offer and 14% made us of the service. Only 54% reported they were aware of the complaints and appeal procedures which is perhaps why only a small percentage took their case to Tribunal. If they don't know it's there, they can't use it. So this means those refused for an assessment (who won't have been in the survey numbers) many not have appealed And if they did, they still won't be in the survey as their cases will take much longer and probably put them out of the survey's date range. Of course, there has to be a cut off point, but choosing a certain percentage of each LA's plans, randomly selected by computer, would give better more representative results. It wouldn't be the same kind of survey, but you would get a better snapshot. This section looked at the perceptions of a plan's quality, its content and how easy or difficult it was to understand. It also asked if parents and young person’s wishes were included and impact of having a plan, based on the support set out in it. 67% agreed it had improved the child or young person’s experience of education. I found this part of the research lacking in content and it seemed to make everything seem woolly and unclear. The format of an EHC plan can be agreed upon by each LA but the SEND Code Practice 2015 (9.62) states the EHC plan must include sections A-K. I have seen EHC plans that do not include all the sections or they are muddled together. Section A of the plan usually contains the parental and young person’s views. I would expect to see this in all the EHC plans. However, if the survey had asked parents and young people about their perceptions of individual sections, e.g. Section B, the special educational needs, Section F, the SEND provision to meet those needs and Section I, the placement, the results could have been different. This is because these sections are appealable. It also highlighted that many parents raised concerns that some SEND case officers seemed unaware of the correct process to follow during an EHC assessment. In conclusion, this 2015 snapshot paints the picture that parents and young people are feeling satisfied with the services they are receiving. This is of course to be welcomed. However, it's really unfortunate that by excluding those in independent settings and anyone whose 2015 plan bled over into 2014 or 2016, the data is skewed and weaker as a result. We don't really know how this data can be used as important questions were omitted. It's a very detailed study though and we have not even covered it all here. All LA case officers being provided with mandatory legal training on EHC assessments and writing EHC plans. How can the EHC plans be legally compliant and provide children and young people with positive outcomes if there is insufficient training? The information about support available for parents needs to be strengthened and made clearer and easier to understand. It's not good enough to bury it in a long letter. Separate leaflets or visual information like our SNJ-DfE Flow Charts should be included. They're freely available and widely praised. Get yours here and share the link with your school and LA. So, if you made it this far, here is your reward - a lovely visual infographic. Download, share, print. It's free. Click it to enlarge. For a higher quality printable PDF version, click here. we weren’t sent the survey-he wasn’t going to independent then. Wonder if anyone else had this experience starting and concluding in 2015 and not sent survey? Yes -they are likely just happy that they got the plan and it wasn’t refused! Again very misleading. Yes, like our LA I am sure many do include a section on parental and child views. But they do NOT treat it as evidence even though it’s from the horses mouth and it is excluded from the section which contains evidence. As we all know, professional reports often contain mistakes and omissions and are often not a true/full reflection of the child’s needs (definitely in the cause of state reports anyway), So they are preferring such reports over bone fide testimony from the child and their parents. Yes, wishes/views included, but fat lot of good it usually does. I find this amazing, considering how much is out there about problems with EHCPs. Is it possible this is again clever analysis? That e.g. it might get them the support they need which is *stated* but other things which are unstated that need to be are not achieved? The 67% is that because the EHCP resulted in a placement at a special or other suitable school which they would not otherwise have had?